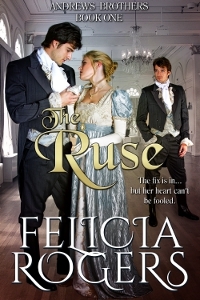 "The Ruse is definitely not your run-of-the-mill Regency read. Filled with the elements of a historical romance novel, Felicia Rogers wrote a darling piece that is filled with adventure and anticipation that will make you want to turn page after page in hopes of finding out what will happen next. Brigitta as a heroine is as independent as she could be, but realistically written as a helpless woman in a time where marriage was the only way for females to escape poverty with dignity. The rest of the characters are also well written; the relationship between the brothers is still quite a mystery (hopefully the author will reveal it in the next book) and I find myself eagerly waiting for the sequel."